The Cabinet discussed Britain’s liabilities for the guarantee of Belgian neutrality under the terms of the European treaty of 1839. 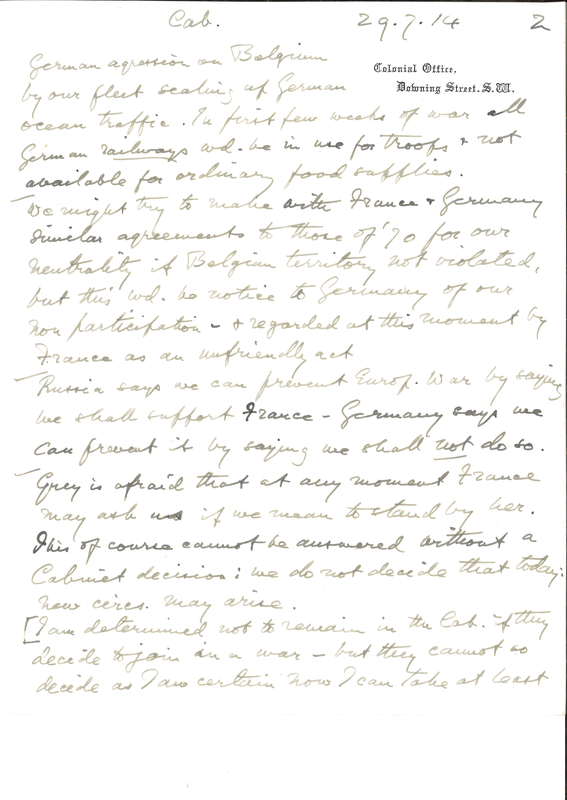 Harcourt outlines the difficulty of the British position: ‘Russia says we can prevent Europ[ean] war by saying we shall support France – Germany says we can prevent it by saying we shall not do so.’ Harcourt writes that Foreign Secretary Grey ‘is afraid that at any moment France may ask us if we mean to stand by her.’ No Cabinet decision was made on this matter today. After Cabinet, Harcourt went to the Colonial Office to send ‘Precautionary telegrams’ to the British colonies and dominions. 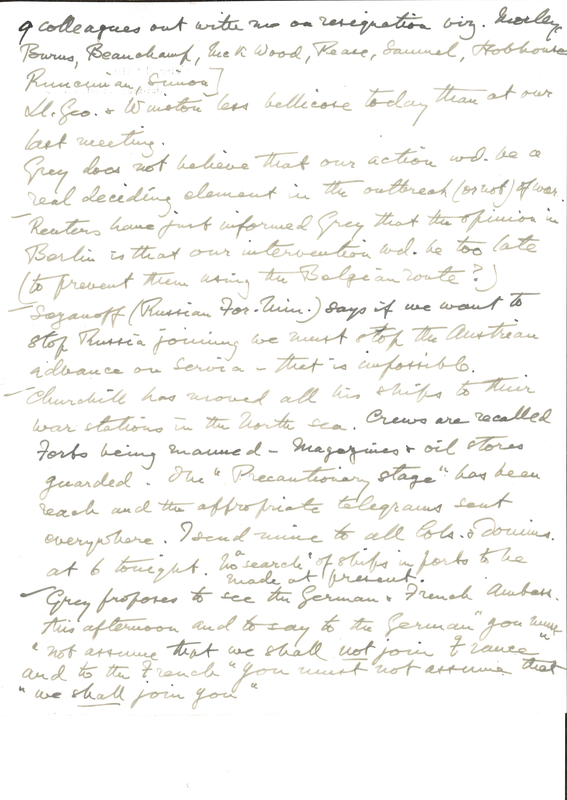 Entry for 29 July 1914 from the political journal of Lewis Harcourt (page 1). 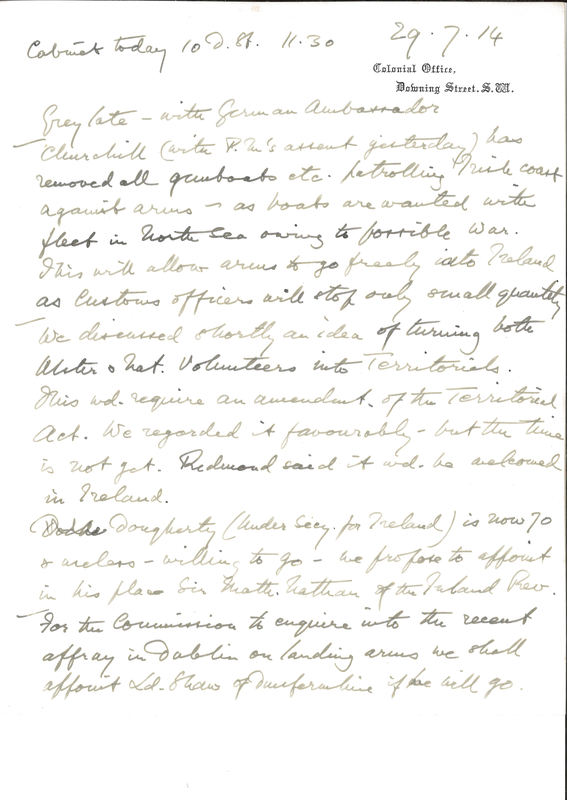 Entry for 29 July 1914 from the political journal of Lewis Harcourt (page 2). 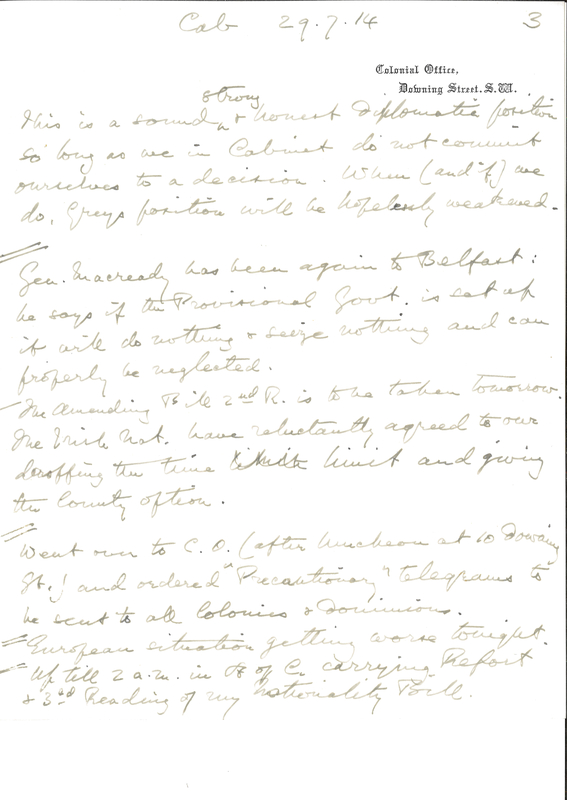 Entry for 29 July 1914 from the political journal of Lewis Harcourt (page 3). Entry for 29 July 1914 from the political journal of Lewis Harcourt (page 4). 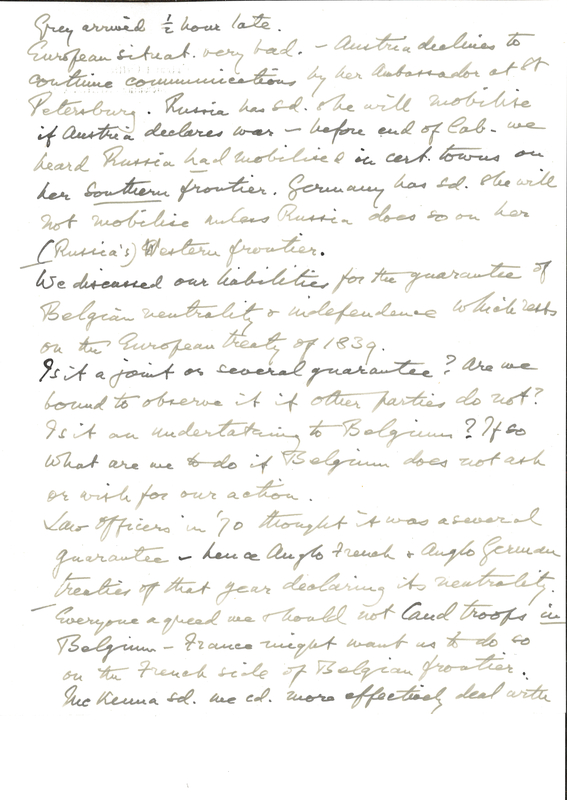 Entry for 29 July 1914 from the political journal of Lewis Harcourt (page 5). 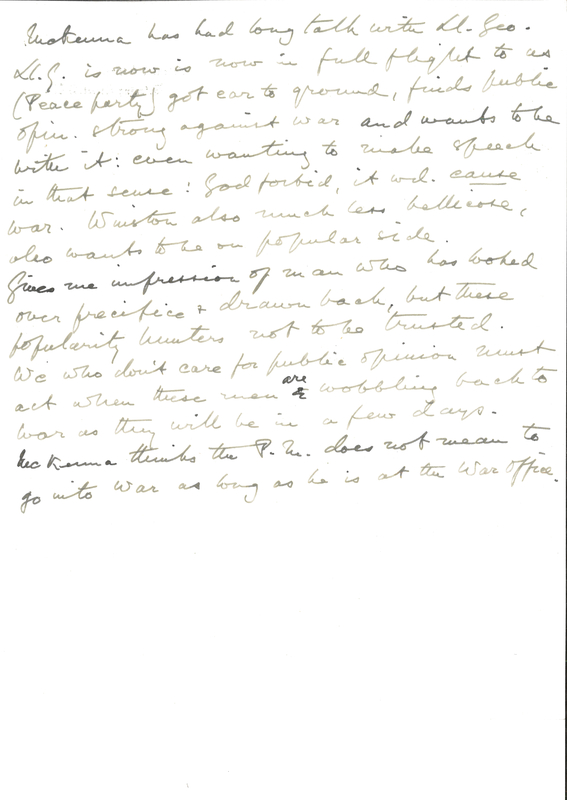 Entry for 29 July 1914 from the political journal of Lewis Harcourt (page 6).